Info "Alien battle stations are attacking! Avoid their fire and escape alive!" Space Escape is a microgame in the Sci-Fi folder in WarioWare, Inc.: Mega Microgame$!. 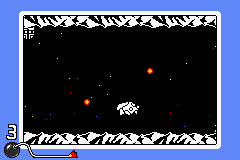 The player controls a starship (the same one that later saves Orbulon in his games) through a tunnel using the . There are turrets on the floor and ceiling that fire at the player's ship, which must be dodged. After dodging shots for a certain amount of time, the ship will go to warp, and the game will be won. As the difficulty level increases, so do the amount of turrets and shots. This page was last edited on September 27, 2018, at 13:31.